Albert Fischer's photography show at the Martha's Vineyard Playhouse will continue through Jan. 31. Albert O. Fischer has spent nearly all of his life on Martha’s Vineyard, where he was born in 1949. Yet it was his one year away from the Island, when he was drafted into the infantry fighting in the Vietnam War, that set Mr. Fischer on his path to becoming an award-winning photographer of Vineyard scenes. 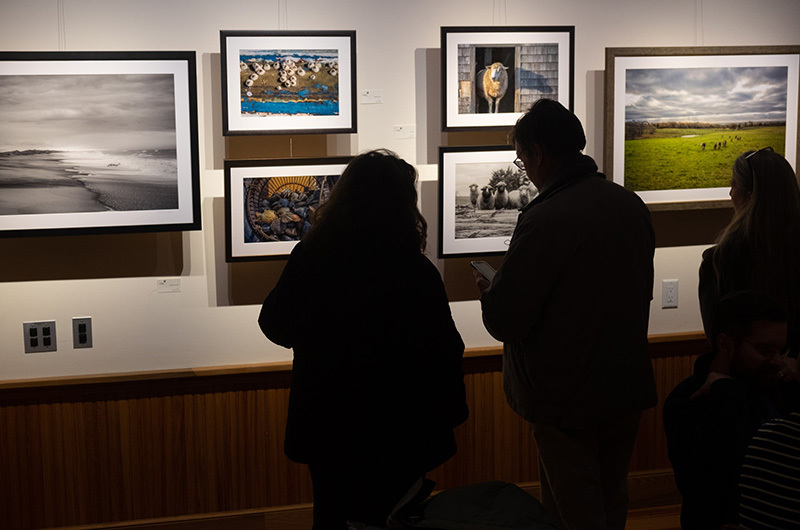 Photography, Mr. Fischer told the Gazette Saturday during a reception for his one-man exhibition in the lobby of the Martha’s Vineyard Playhouse, helps keep at bay his lingering, intrusive thoughts and memories of the war. Mr. Fischer’s path to the arts might have begun sooner, but for a discouraging first-grade teacher. “I’m color blind,” he explained. “I drew a purple cow on brown grass, and the teacher embarrassed me.” She even brought up the drawing during a parent-teacher conference, Mr. Fischer added. But young Albert would meet and befriend another adult who revived his interest in the visual arts. “Alfred Eisenstaedt used to come to the Menemsha Inn. I got to know him really well,” recalled Mr. Fischer. Years later, in 1970, on his way home from Vietnam after his tour of duty, Mr. Fischer purchased a Minolta 35-millimeter camera with a set of lenses during a stopover in Japan. For the nearly half-century since, he has rarely been without at least one camera close at hand. “When I’m feeling really stressed, I’ll get my camera and go,” he said. Driving up-Island roads in his job as an estate caretaker, Mr. Fischer said he often keeps a camera in his lap so he’s ready to pull over and capture an appealing view or an elusive creature. 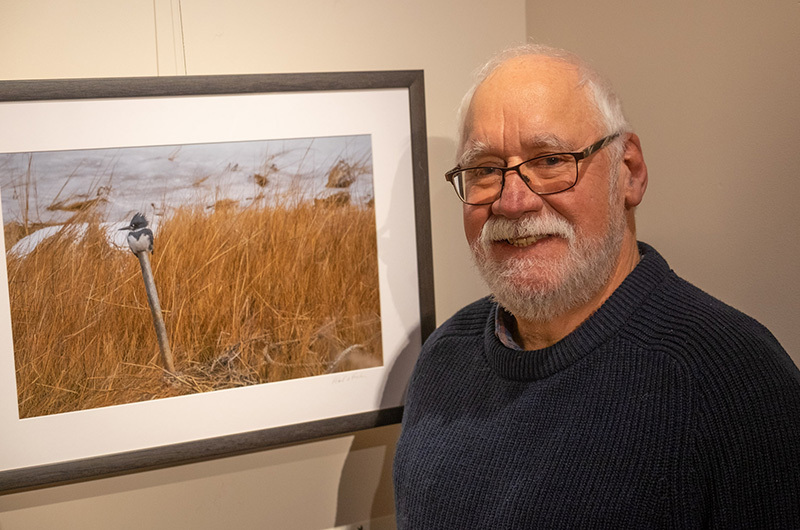 Three of his 17 photos at the playhouse focus on wild Island animals: a glaring snowy owl, a white-tailed deer and a belted kingfisher, its beady eye and dagger beak aimed fiercely at prey (or rivals) outside the frame. Other images at the playhouse offer expansive views of beloved Island scenes: a deserted South Shore beach; Menemsha Basin after a snowfall; a peaceful moment on Squibnocket Pond. Although many of the photographs do not include people, their presence is always felt. One of Mr. Fischer’s favorites is of Keith Farm, next door to where he grew up. Rays of sun pierce a lattice of clouds and the sea gleams beyond the trees as cows amble across the pasture toward the viewer. While he likes to shoot at all times of year, “I prefer to go where I don’t see any people,” Mr. Fischer said. Still, the near presence of humanity is felt in many of his images. Both of the birds, for instance, are perched on man-made materials. The kingfisher surveys his territory from a metal stake, while the snowy owl’s yellow eyes stare down the viewer from a stack of lumber at Beetlebung Farm in Chilmark. The deer, too, seems aware it’s being observed. Humanity is also felt, if not seen, in a group of photos from the Menemsha waterfront, particularly the large image titled Wheel House. Taken inside Stanley Larsen’s boat Four Kids, the photo is filled with the authentic clutter of a commercial fishing vessel. “You could almost imagine a person,” said Tom Dresser, as he regarded the photograph at Saturday’s reception. 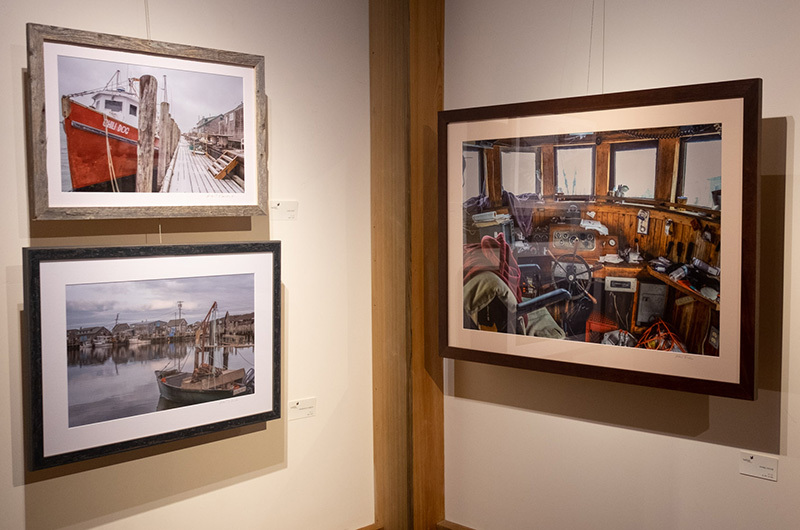 Mr. Larsen does appear in his wheelhouse in another photo by Mr. Fischer, not hanging in this show, that won first prize for excellence in the 2018 New England Newspaper and Press Association contest. All of the photographs in Mr. Fischer’s playhouse show are also for sale, with prices ranging from $200 to $1,000 unframed and $285 to $1,200 framed. The exhibition is on display through Jan. 31 at 24 Church street in Vineyard Haven. Outstanding "Eye" for the capturing the moment, Albert, no matter where you are. Wonderful insights into island life from a trained eye that truly comprehends composition! Congratulations Buck on another great showing of the special island moments captured in your daily travels. One can sense the peace of mind behind the lens. Happy trails to you. Wonderful article on an inspirational artist! Now I have to be "that guy". With the playhouse fighting a decision by the town to be taxed, does this show weaken their case? Is this part of their charitable mission? I might have thought so until I read the last paragraph. This is clearly a commercial enterprise, competing with for profit galleries, and not providing a service the government would otherwise. This temporary enterprise is occupying a supposedly charitable structure. It would be great to have more clarification on how tax exempt real estate can be used. This is not helping the case for the playhouse. Great work by a great American!